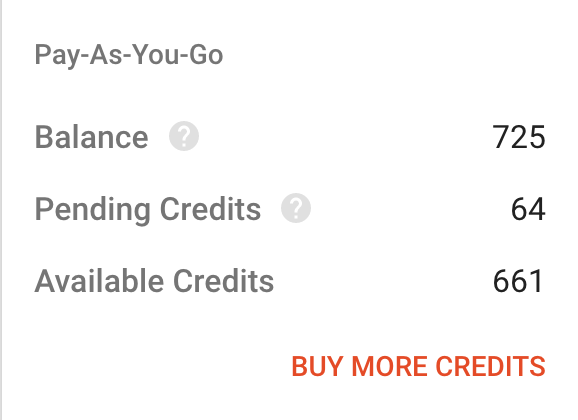 Why Are My Credits Pending? When you go through the five step process of creating a broadcast, credits will be in a pending status. The credits will leave the pending status once a broadcast has completed. The amount of credits that go into a pending status is based on how many calls/texts you are making and how many credits you have available. The broadcast will make you aware of this in the recording instruction step in Create a Broadcast. Example:This voice broadcast contains 17 phone numbers. You are able to record up to 120 seconds because you have enough credits in your account to do so. We provide a range of how many credits will be consumed simply because we don't know how long your voice message will be and, therefore, how much to charge your account for. Pending credits will also appear on your home screen. Notice the credits are still showing the maximum in this screen. This number will change to the actual amount after your recording is created.